If you haven’t read my first post, União da Madeira are a small provincial club based on the island of Madeira, a Portuguese archipelago just of the coast of Morocco. 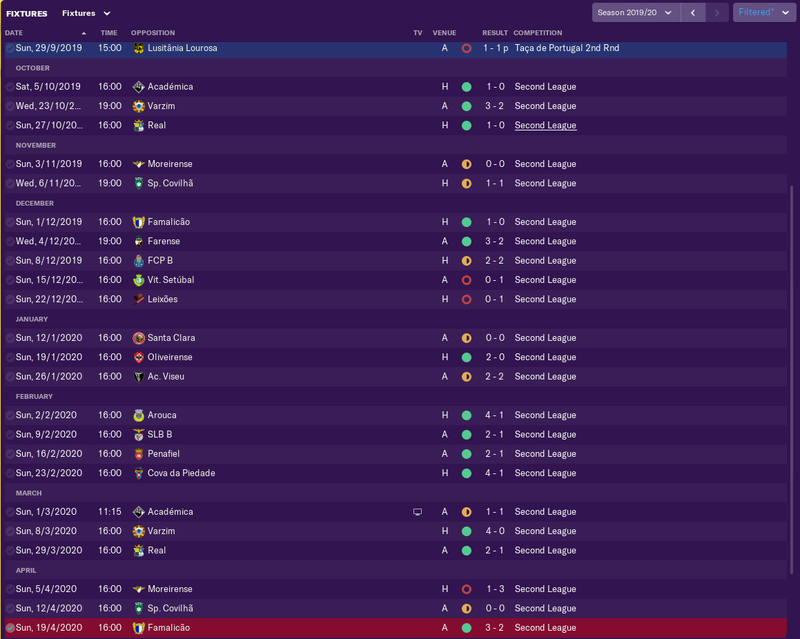 In my first season we achieved a fairly routine promotion to the second tier of Portugal, next I had my eyes set on the Premier League. Back to back promotions are difficult, but not impossible. There are a few key things I would recommend. Today I’m going to take a closer look at my transfer policy on lower league saves and how I go about my business. Making money on a small island in the middle of the Atlantic is difficult. Club finances aren’t great, with a lot of money being spent travelling to and from Madeira for away games. 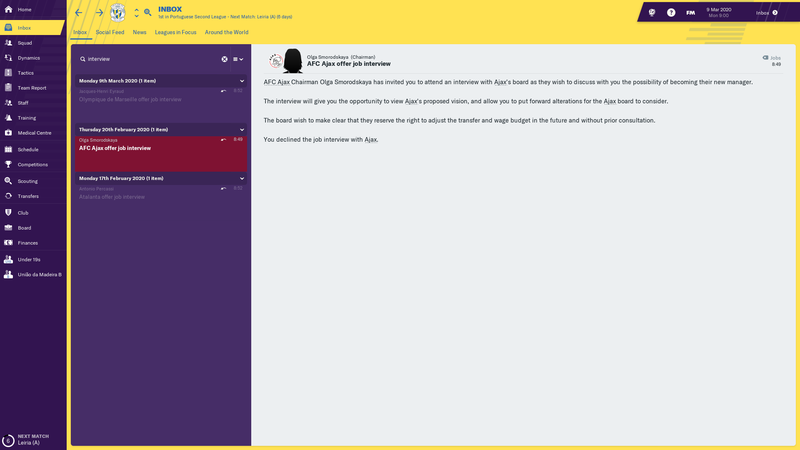 At lower league level, it’s crucial that you are keeping the club finances in check, and a great way to do that is through player sales. Hopefully, using my tips, you too can learn how to be a ‘Wheeler Dealer’. Portugal is renowned throughout European football as a selling nation. Last summer alone, the big three raked in over €190m in player sales, with players such as Diogo Dalot, Rui Patricio and Ricardo Pereira all making big money moves to the Premier League. With news surfacing that Raul Jimenez has a €35m option to buy clause on his loan deal, it’s easy to see why clubs in Portugal are willing to sell their players off to bigger and better things. I wanted to bring this Portuguese transfer policy to my save, implementing it lower down the pyramid. Below are my transfer dealings during my second season. I always spend a lot of time searching for players in the final year of their contract and signing them on frees. I tend to bring in players Under-23 who have at least 4 star potential, then even if they don’t feature you can sell them on later at a profit. If there are any positions I can’t fill with free transfers, I look at bringing in loan signings from top teams in the country. When it comes to attributes, there are a few that stand out as key for any position. Below is my search criteria. I will drop the value until the search begins to populate, looking to match 9 or 10 out of the 11 attributes. Any hits will be scouted fully and (generally) signed on a free, even if I don’t intend to play them in my team. Almeida scored 23 on loan last season, but after picking up cruciate ligament damage he was ruled out for the season after only four games. Diogo was brought in as a first team option with potential to improve in the future. He played all 34 games, conceding just 31 goals. Conte started every game and played 25 games the previous season on loan. A signing from Sporting along with Diogo Sousa. One of the few foreign signings we made, Alessandro is now one of the best Centre-halves at the club, and has potential to be Premier League standard in the future. A Brazilian centre-back who can take free kicks, what’s not to love. Madeira’s answer to David Luiz signed in January, playing all 17 games in the second half of the season. All these signings made an impact on the first team, but many others were brought in to be loaned straight back out, and will be sold on later for a profit. 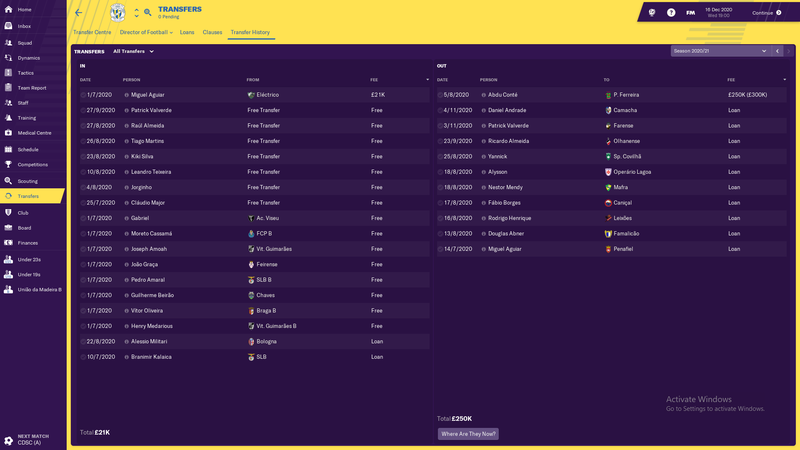 Since Madeira is an island, it can be quite difficult to schedule friendlies as a way of bringing in extra cash. Turning a profit on players will be key to keeping the club solvent. I find a Spreadsheet really helpful to track where you have cover for positions and where you need to sign players. Colour coding is useful to see your different levels of player and it’s really useful to see where you can afford to lose players too. Here’s mine for reference. We started the season tremendously, winning five of our opening six, and by December we had only dropped 9 points. However, a few injuries to key players over the winter, such as our top scorer from least season Ricardo Almeida meant we dropped a lot of points over the Christmas period. After bringing in Derlan in January to strengthen at centre-back, we mounted another fine run of form, taking us one win away from the title with four games left to play. Our title decider was a home game against Farense. I reminded the players that a win would secure us promotion to the Portuguese Premier League. They didn’t let me down. We took the lead after just 45 seconds and went on to win by a convincing eight goals. We ended up finishing top by 10 points, with 20 wins from our 34 games. União da Madeira were going back to the top division of Portuguese football. During the following transfer window, we made some more free signings and sold some players on at a profit. As you can see, Abdu Conte who we signed on a free at the start of the season was sold on for £300K. A lot of these free signings might not even play for us, but we can bring in some well needed cash from selling them on after a season or two. Harry Redknapp would be proud. Let’s take another look at those aims. Challenge for a Portuguese League Title. Establish União da Madeira as the biggest club in Madeira. Have a stadium built for the club. Next on the list is challenging for a title, which may be a few seasons away. If we can continue to build as we have so far, I can’t see any reason why we can’t reach the pinnacle of Portuguese football. If Madeira can keep hold of me that is. This save has really made me fall in love with FM again. I play the game a lot, and I always enjoy it. But this save has really got me invested and I’m really enjoying writing about my saves again. Hopefully it will stay that way and I can sink a few years into this save and really make the most of it. Thanks for reading and I hope you enjoyed my piece. More are on the way, you can also check out more of my content here. Check out DtG Social Media below. Ipswich Town: Where did it go wrong?